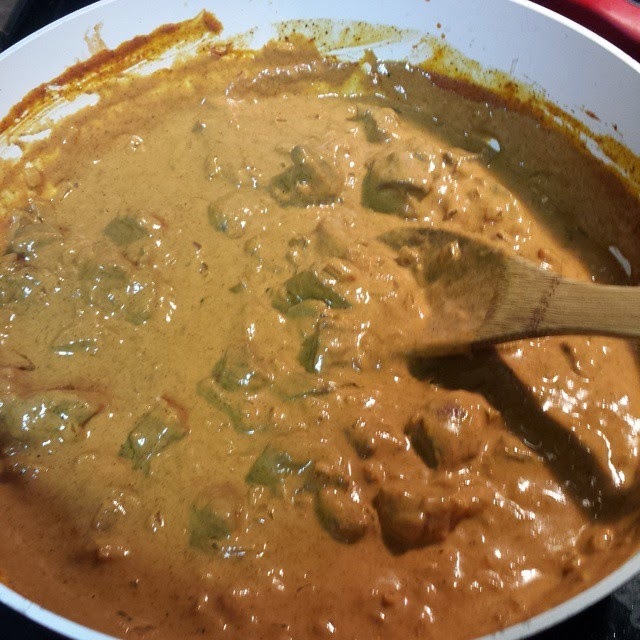 everything added together for beef tikka masala! • heat ghee in a large skillet over medium heat and cook and stir onion until translucent, about 5 minutes. stir in garlic; cook an stir just until fragrant, about 1 minute. stir cumin, 1 tsp salt, ginger, cayenne pepper, cinnamon, and turmeric into the onion mixture; fry until fragrant, about 2 minutes. • stir tomato sauce into the onion and spice mixture, bring to a boil, and reduce heat to low. 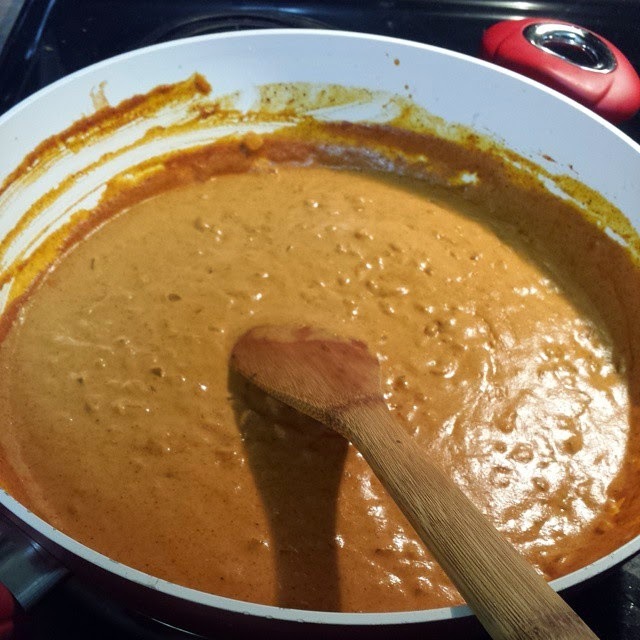 simmer sauce for 10 minutes, then mix in cream, paprika, and 1 tbsp stevia baking blend. bring sauce back to a simmer and cook, stirring often, until sauce is thickened, 10-15 minutes. • heat oil in a separate skillet over medium heat. stir beef into the hot oil sprinkle with curry powder, and sear until lightly browned but still pink inside, about 3 minutes; stir often. transfer beef and any pan juices into the sauce. 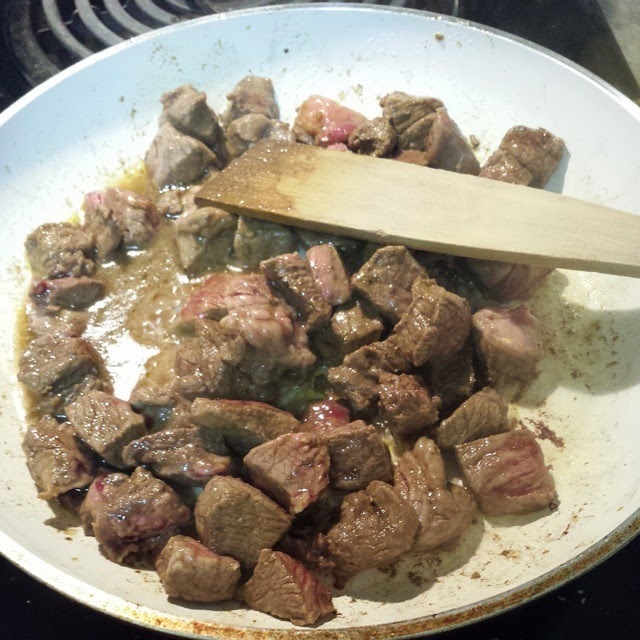 simmer beef in sauce until no longer pink, about 30 minutes; adjust salt and stevia to taste. Also, as a side note, this is not a dish you would ever find in India. Why? Because Hindis don't eat beef because cows are sacred creatures. Honestly, I prefer lamb, but it's so pricey and I just didn't want to spend the money on it right now. Also, this particular recipe did originally call for chicken, but while I like chicken, I'm not a huge fan of it cubed in a sauce. This looks delicious! Any chance you can tell us how it tasted? Salty? Sweet? I've never had it. Way to go on 20.5, you should be over your 100 now right? Love you! Wonder how it would be with tofu... I should try it.